Today the construction of the 690MW platform for TenneT's offshore grid connection project HelWin2 officially started. The steel cutting ceremony took place at the yard of Heerema Fabrication Group in Zwijndrecht (the Netherlands), where the topsides of the platform will be built. The jacket and bridge will be constructed at the Vlissingen yard of HFG in the Netherlands. HelWin2 project is one of the 10 TenneT projects enabling the transport of offshore wind power. 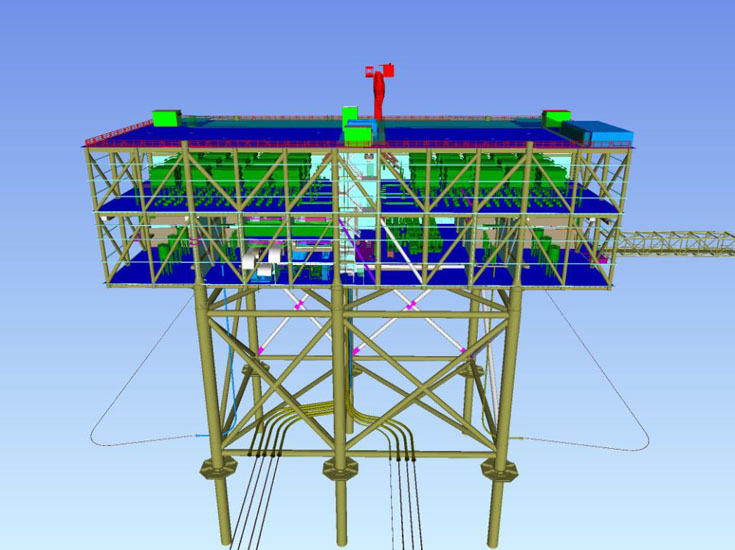 The HelWin beta platform will be built for electricity grid operator TenneT by the Heerema Fabrication Group and is an EPCI contract (Engineering, Procurement, Construction and Installation) between Siemens and Heerema Fabrication Group. The platform has been developed jointly by Heerema Fabrication Group and Siemens, main contractor for the HelWin2 project. The platform will connect a large wind farm cluster in the German sector of the North Sea. It will receive alternating current from wind farms, and convert it into direct current before transporting it onshore via subsea cables. The 98 by 42 meter steel structure of the platform topsides will be more than 27 meters tall and weighs over 10,000 metric tonnes. During 2013 an average of 450 people will be working on the Heerema Zwijndrecht and Vlissingen fabrication sites, excluding engineering and additional supply chain jobs. The platform will be ready for sail away from the Heerema yard by mid 2014 for installation during the 3rd quarter of 2014. 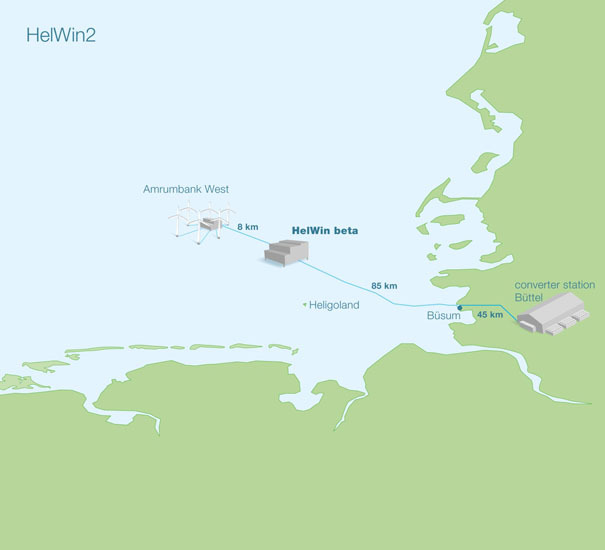 The HelWin2 project establishes a 690 Megawatt grid connection for wind farms close to Heligoland. This TenneT project is the third connection in the eastern North Sea. The first offshore wind farm that will be connected is Amrumbank West. The grid connection runs 45 kilometers across land from the converter station in Büttel to the coast, and from the landing point in Büsum a further 85 kilometers directly to the offshore converter station. The connection should be completed by spring 2015. TenneT is a leading electricity grid operator in the Netherlands and a substantial part of Germany, through its subsidiary TenneT TSO GmbH. With over 20,000 kilometres of high voltage lines and 36 million end users, it ranks among Europe’s top 5 electricity transmission system operators. The State of the Netherlands holds the entire issued share capital of TenneT Holding B.V. TenneT’s head office is located in Arnhem in the Netherlands and TenneT TSO GmbH’s main office is located in Bayreuth in Germany. More information is available at: www.tennet.eu. Heerema Fabrication Group (HFG), headquartered in Zwijndrecht, the Netherlands, is a leading engineering and fabrication contractor for large and complex offshore structures to the global oil & gas and energy industry. HFG owns three large production locations situated around the North Sea (Vlissingen and Zwijndrecht (the Netherlands) and Hartlepool (United Kingdom) and an engineering company in the Netherlands (Zwijndrecht). In addition, HFG owns a fabrication facility in Poland (Opole). 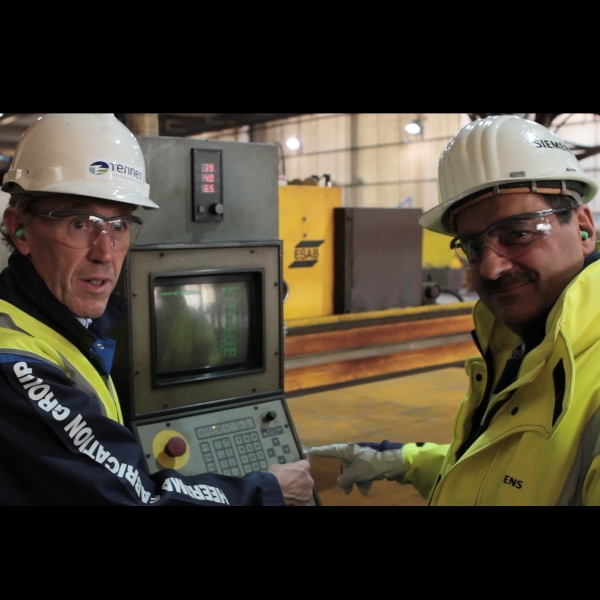 Heerema Fabrication Group employs over 1,000 people and is part of the Heerema Group. Further information is available at: www.heerema.com. Artist impression of HelWin beta platform. Dutch press release: Start bouw Tennet´s HelWin beta platform op Heerema werf.